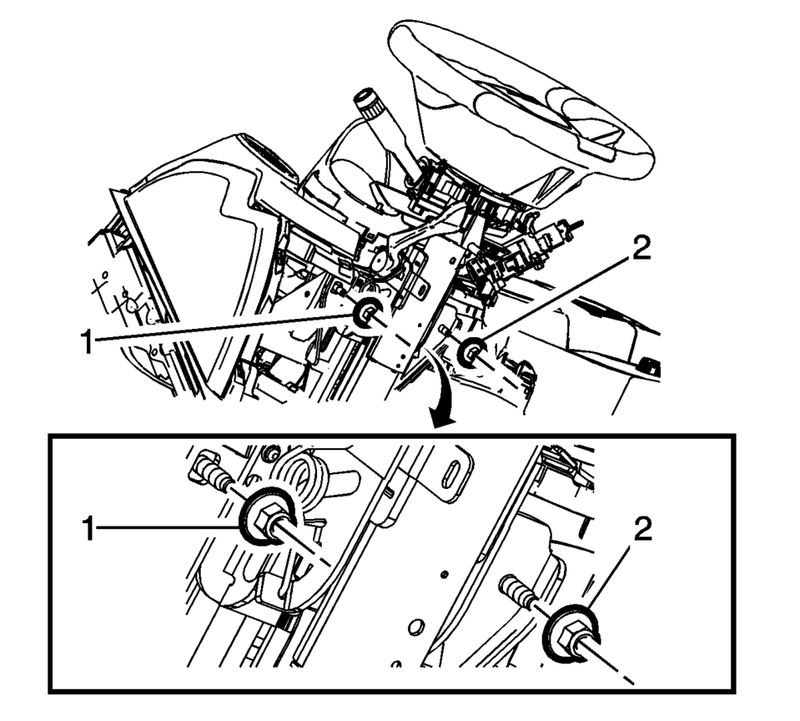 After disconnecting these components, do not rotate the steering wheel or move the front tires and wheels. Failure to follow this procedure may cause the SIR coil assembly to become un-centered and cause possible damage to the SIR coil. If you think the SIR coil has become un-centered, refer to your specific SIR coil’s centering procedure to re-center SIR Coil. With the steering wheel in the straight ahead position, LOCK the steering column. Remove the left side floor air outlet duct. Refer to Floor Air Outlet Duct Replacement - Left Side. Use paint in order to place match marks on the intermediate steering shaft (1) and on the steering gear pinion shaft (3). Remove the intermediate steering shaft lower bolt (2). Disconnect the intermediate steering shaft from the steering gear pinion shaft. Do not support the steering column by only the lower or upper support bracket. Damage to the column lower bearing adapter could result. 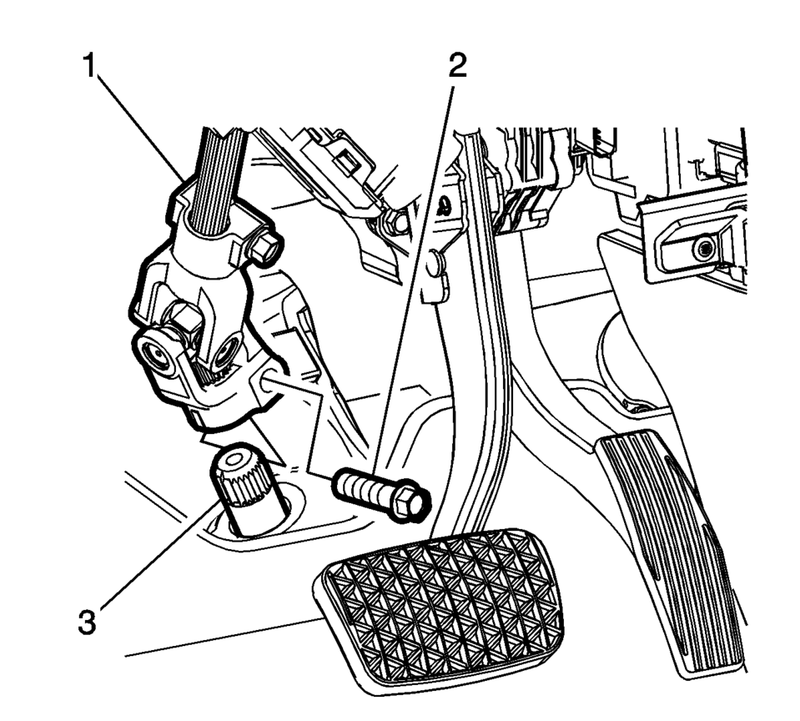 Remove the 2 steering column lower support bracket bolts (1, 2). Remove the 2 steering column upper support bracket nuts (1, 2). Once the steering column is removed from the vehicle, the column is extremely susceptible to damage. Dropping the column assembly on the end could collapse the steering shaft or loosen the plastic injections, which maintain column rigidity. Leaning on the column assembly could cause the jacket to bend or deform. Any of the above damage could impair the columns collapsible design. Do NOT hammer on the end of the shaft, because hammering could loosen the plastic injections, which maintain column rigidity. If you need to remove the steering wheel, refer to the Steering Wheel Replacement procedure in this section. Remove the steering column assembly (1) from the vehicle. If you are replacing the steering column or the intermediate steering shaft, copy the match marks from the old parts to the new parts. Do NOT allow the wiring harness to be pinched between the motor/module assembly and the steering column during installation. A pinched harness will cause diagnostic trouble codes to be set and may require replacement of the steering column. Position the steering column assembly (1) in the vehicle. Align the match marks and connect the intermediate steering shaft to the steering gear pinion shaft. Tighten the steering column lower fasteners before you tighten the steering column upper fasteners. Failure to do this can damage the steering column. Tighten the steering column fasteners to the specified torque. 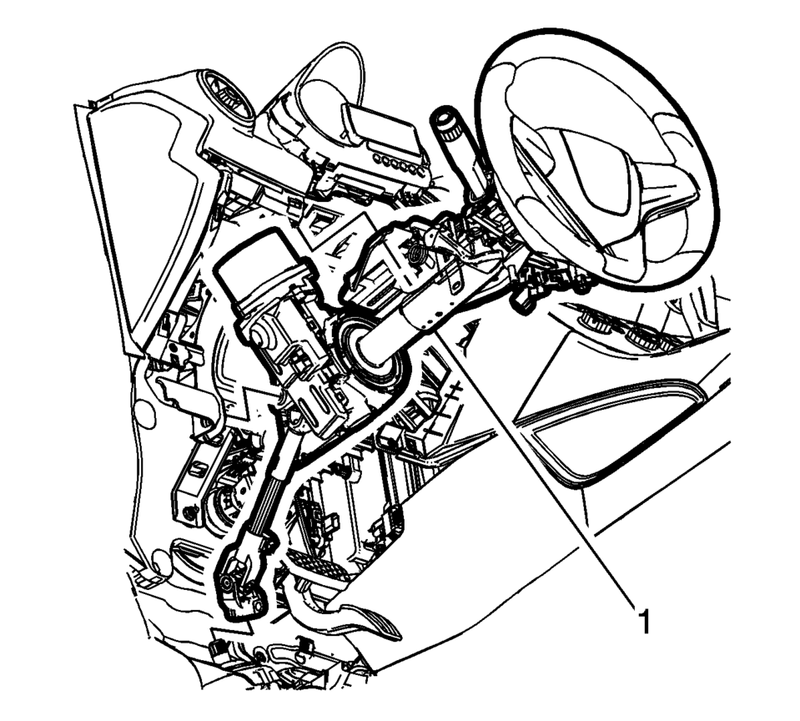 Overtightening the upper steering column fasteners could affect the steering column collapse. Ensure all fasteners are securely seated before applying needed torque. Failure to do so may result in component damage or malfunctioning of steering column. Install, but do not tighten, the 2 steering column upper support bracket nuts (1, 2). 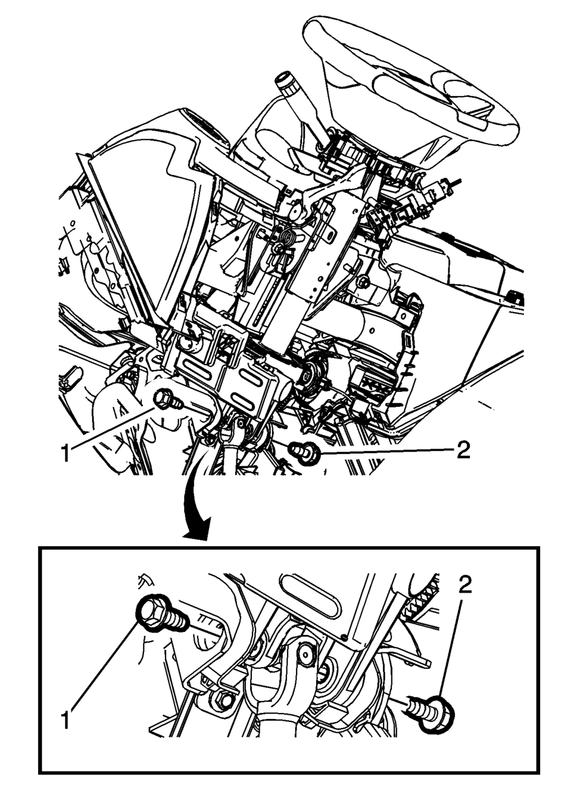 Install, but do not tighten, the 2 steering column lower support bracket bolts (1, 2). Connect any electrical connectors as necessary. Install the left side floor air outlet duct. Refer to Floor Air Outlet Duct Replacement - Left Side. Install the upper trim cover and the lower trim cover to the steering column. Refer to Steering Column Lower Trim Cover Replacement. Setup the power steering control module. Refer to Power Steering Control Module Programming and Setup. Center the steering angle sensor. Refer to Steering Angle Sensor Centering.